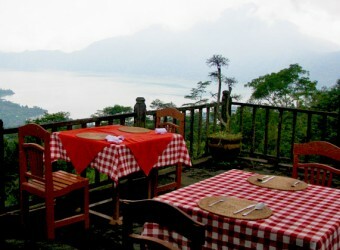 Bali Restaurant Enjoy lunch at a restaurant overlooking the beautiful view of Mount Batur! Merta Sari restaurant is a popular restaurant located at Kintamani. The restaurant offers Indonesian buffet, you will get greeting from the staffs in kebaya while arriving at the restaurant. The fog will descent to entire area of Kintamani in the afternoon, so before noon is the best time to go.